The first poster for Hobbs and Shaw has arrived. Dwayne Johnson has officially started doing his usual thing and has been getting the hype train moving in the right direction for the upcoming Fast and Furious spin-off. The movie sees Johnson's Luke Hobbs, who was introduced to the franchise in the fifth movie, teaming up with Jason Statham's Deckard Shaw, a major villain turned good guy. This poster makes it inescapably clear that these two men come from totally different worlds. Hobbs appears on the left side of the poster leaning on his motorcycle in the middle of the road, palm trees and the ocean in the background. 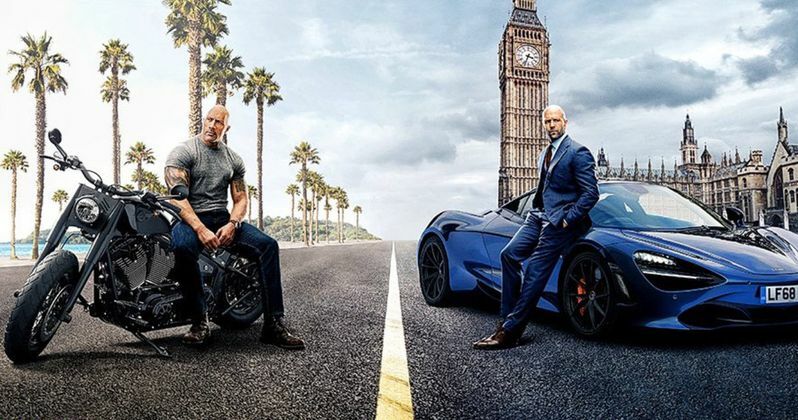 A solid yellow line divides the two, with Jason Statham on the other side of it, leaning against a very fancy and expensive supercar, with Big Ben and the London skyline in the background. Dwayne Johnson had this to say in sharing the poster to his Twitter account. "Two world's collide. Exclusive peep at our new poster for Hobbs And Shaw. Our worldwide trailer drops tomorrow. Get ready for the biggest showdown the Fast & Furious franchise has ever seen. #HobbsAndShaw #Boots2Asses". Oddly, this poster is in the shape of a square, as opposed to the usual vertical posters we see in movie theater lobbies. But yes, as previously revealed, the full trailer for Hobbs & Shaw is set to drop tomorrow, as previously teased by Dwayne Johnson, who shared a very brief teaser for the trailer. It's also promised that the movie will be getting a Super Bowl spot on Sunday, which means Universal is shelling out big bucks to raise awareness. And, not for nothing, but even by Johnson's standards, claiming that this is going to be the biggest showdown in the history of the franchise is a very bold statement. This franchise was built, with much success, on big, crazy showdowns. That showdown will involve our titular characters doing battle with a villain played by Idris Elba. The cast also includes Mission: Impossible - Fallout star Vanessa Kirby, Baby Driver breakout Eiza Gonzalez and WWE star Roman Reigns as Hobbs' brother in his movie debut. Originally, Dwayne Johnson wanted Aquaman star Jason Momoa to play the part, but they couldn't make the timing work out with his busy schedule, which is unfortunate, to say the least. David Leitch, coming fresh off of his very successful turn at the helm of Deadpool 2, is in the director's chair. This is just the first of several planned spin-offs within the franchise, as Vin Diesel recently announced that the female-led FF movie is coming together behind the scenes. Fast & Furious Presents: Hobbs & Shaw is set to arrive in theaters on August 2. We'll be sure to bring the trailer your way as soon as it's made available tomorrow. In the meantime, be sure to check out the new poster from Dwayne Johnson's Twitter account below.